On Saturday 3rd December, we took to the stage in school for our first public appearance - to a very full school hall! The lower school singers performed beautifully first, and then our choir nervously followed. We needn't have been nervous: the audience were great, and we all felt that this was a good start to our Christmas performances. 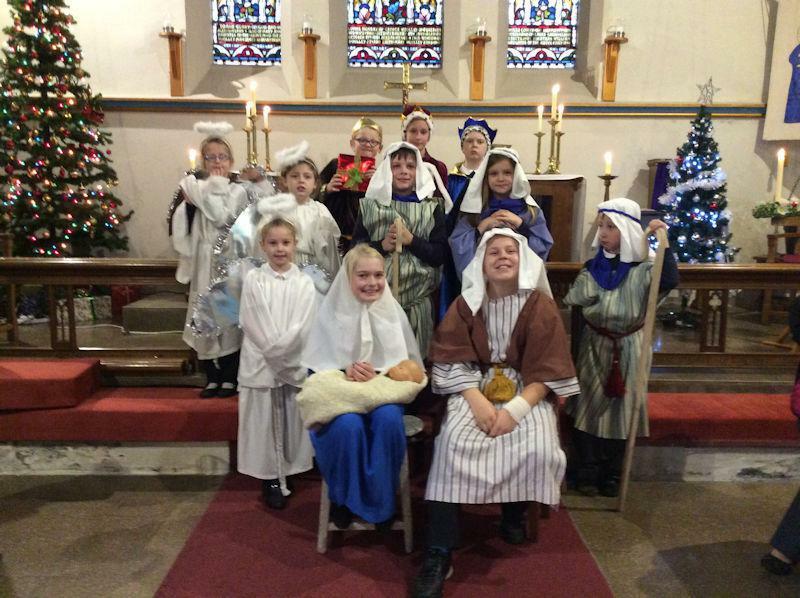 Our Church Carol Service for KS1 and 2 was at St James', Crosshill on Monday 12th December. The choir sang three songs, one of which was sung in parts with the other children. Tuesday 13th December. It rained. Then it didn't. Then it did again. Then it stopped. Thankfully, the weather was on our side as the choir sang in the smashing annual carol service at Codnor Market Place. The service is organised by our local councillors, and this year featured the Heage Brass Band. We meet in the Methodist Chapel. All lined up on the market place. Joining in with the congregation. On Wednesday 14th December, we performed to members of our local community at Tesco! Despite a couple of technology 'challenges' which had Mr Buckle and Mr Blake frantically pressing buttons and cleaning CDs, the choir sang on regardless, and we'd like to thank all the people who turned up to support and encourage us. Tesco also gave us a great big tin of sweets - jackpot! Thanks to Hayley for the pics. To round off a super year, the choir performed at Carols Around the Tree in school on Friday 16th December. The community packed out the hall, and we were joined by the Mayor of Heanor and Loscoe Town Council. The annual Carols Around the Tree event also features music from our instrumentalists (piano, brass, violin, guitar and bells), and performances from some of our Christmas Poetry Festival winners. A lovely way for families to start their Christmas celebrations. The audience get settled in. The choir gets into position. Photo opportunity with the Mayor! We've had some really lovely comments from the community about our choir this year. One gentleman actually made a special visit to school just to say how much he'd enjoyed the choir's singing at Codnor market place. Thank you! For the choir to work, we rely heavily on the help and support from parents at home, learning the songs with their children and bringing them to events which take place outside of school hours. You are much appreciated. The school governors also want to pass on their thanks and appreciation to all of the staff involved in teaching and running the choir. One of our governors wrote: "The choir is a credit to our school." Most importantly - thank you to our fantastic children. You worked hard to learn the songs, gave up your lunchtime breaks for rehearsals, and really shone in your performances. We are very proud of you. Great job, guys!